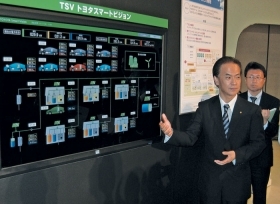 Shigeki Tomoyama, head of information technology at Toyota, shows how to cut carbon dioxide emissions by linking plug-in hybrids to home electrical grids. TOKYO -- Toyota Motor Corp.'s vision of interconnected electrified cars and local electricity grids could cut carbon dioxide emissions 75 percent, an executive says. By connecting gasoline-electric hybrid vehicles to a household's electrical system, home and car owners can cut emissions by coordinating total energy use. For example, an integrated computer system can program the car to charge at night, when electricity costs are lower. Or it can program solar panels to collect electricity during the day for storage in high-density batteries that can be tapped later during hours of peak demand. The concept isn't new. Nissan Motor Co. is rolling out a version of home-car interconnectivity with its Leaf sedan, which debuts in December. Owners can use mobile phones to program the Leaf remotely to recharge at home. Since last month, Toyota has been testing its smart-grid technology at the village of Rokkasho in northern Japan, where two houses are linked to eight plug-in Prius hybrids. Rokkasho is known mainly for its role in Japan's nuclear-power industry, as home to a uranium enrichment and plutonium reprocessing plant and low- and high-level nuclear-waste storage facilities. Trials will continue for two years. The goal is to tune the system for commercialization. Toyota did not give a timeline, but it wants to expand use by 2012, when it plans to sell tens of thousands of plug-in hybrids in Japan and launch an all-electric vehicle. Shigeki Tomoyama, who heads information technology at Toyota, said the system could slash carbon dioxide emissions 75 percent from the pattern of using gasoline-powered vehicles that aren't linked to a house's electrical grid. Toyota said it has a leg up in smart-grid technology because of its expertise in making both automobiles and houses, through its affiliate Toyota Housing Corp.